Common Goal is uniting the football community in tackling the greatest social challenges of our time. An incredibly important part of this team are the football for good organisations, young leaders, and participants that are facing these challenges head on all around the world. Below is a story about one of those participants Kimleang from SALT Academy. Before the playing field can be levelled, sportspeople must first be able to actually set foot on it. In many countries in the world, girls who wish to do so must first overcome a number of obstacles barring their way. The first time Kimleang kicked a football she was ten years old. The boys in her neighbourhood asked her to join their game and she agreed. “They didn’t really want me to play,” she says, “I was a girl, it was strange! But they needed one more player.” So, gender stereotypes were cast aside while Kimleang and her new-found teammates collected plastic bags and bound them together with string into a football-shaped object. But the match was a one-off. Kimleang enjoyed the game “even though I wasn’t very good,” she admits. But football just wasn’t a game girls played, so she didn’t even consider it. Instead she took up dancing. “But my parents hated that, too,” she laughs. They had other concerns. Financial hardship meant that the oldest of her four siblings had to work to support the family. To make matters worse, her father started drinking and often became violent. Kimleang’s mother bore the brunt of his alcohol-fuelled rage. According to a recent UNICEF report, 42 percent of adolescent women themselves believe that wife beating is justified. The subordination of women in Cambodian society is entrenched in a set of traditions and beliefs passed on from generation to generation. “Men are gold and women are cloth” is a Khmer proverb that expresses how highly regarded the male gender is, while as a woman it is easy to become tarnished. At school, children learn the traditional Khmer prose poems, Chbab Proh and Chbab Srey, which enforce strict codes of conduct for men and women. Girls and women are expected to be gentle, reserved and obedient. For many years, it was a belief Kimleang didn’t question. It was only when a school friend persuaded her to play football again and she rediscovered her passion for the game that Kimleang decided it could indeed also be a “girl thing”. She still wasn’t good, but she was hooked and begged her parents to allow her to play. She told them resolutely: “If you want me to stop dancing you must allow me to play football”. 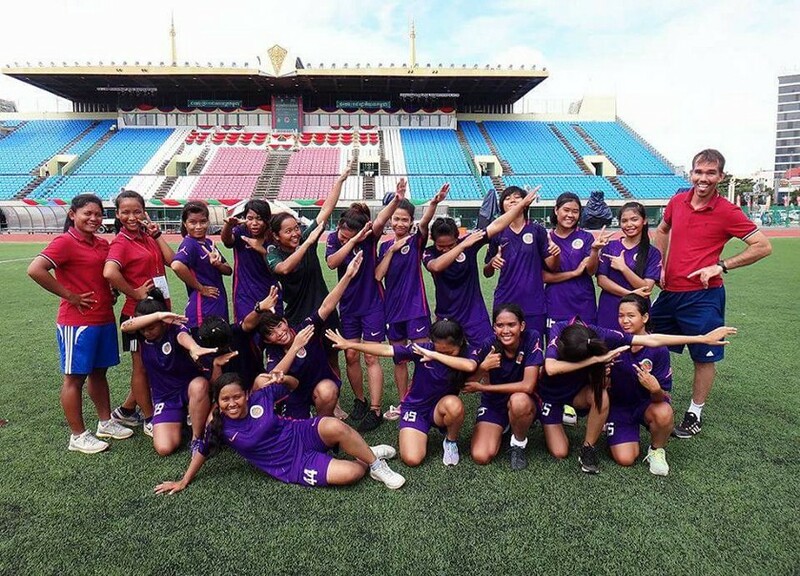 By then, Kimleang had already met members of the Sport and Leadership Training Academy (SALT), who wanted her to join the Mighty Girls programme. She turned to them for help and they sat down with her parents to explain the opportunities of the football and the programme to them. They may not have been fully convinced, but they agreed. Kimleang had the permission she needed. Every morning, Kimleang now gets up at 5am to travel across Cambodia’s second largest city, Battambang, to the Mighty Girls home where most of the girls live. Many of them come from other provinces, but as Kimleang’s family lives in Battambang, she doesn’t need to board. Together with her fellow “Mighty Girls”, she has breakfast and changes into her uniform before they walk to the academy. Each day is a mixture of classes in different academic subjects and football training. “Except on Mondays”, Kimleang laughs, “then we have gymnastics”. The programme targets girls from disadvantaged backgrounds and works towards three main goals: To provide a “safety net” for individuals at risk of human trafficking, support girls’ education and to promote gender equality. The programme both offers individuals opportunities they would otherwise not have, teaches them important life-skills and builds their confidence. This coming October, Kimleang will graduate. Her plans for the future are clear: “I want to study English literature and Management. I wish that I can study in the US. First I think that the US is good for English because I like learning English and secondly, because women’s football is really big. I would love to play football there for my university. 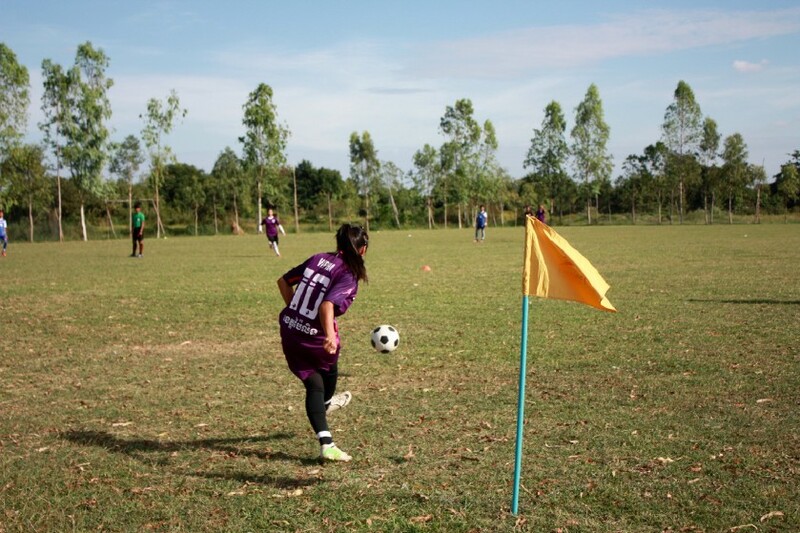 And then come back and work here at SALT.” One day, she dreams of working for the Cambodian Football Federation — “but it is really hard to get in to,” she admits. After winning the National Championship with the Mighty Girls team last year, she has already achieved one goal that previously seemed impossible to even aim for. Kimleang’s story appeared originally in streetfootballworld’s Football4Good magazine.